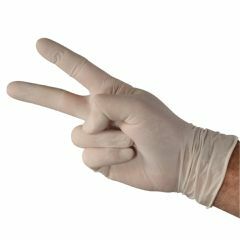 These latex powder-free exam gloves offer smooth inner and textured outer surfaces with excellent tactile sensitivity. I use these gloves to change diapers and clean up at my home daycare. They are strong, flexible and a great value. Comfortable. Versatile. take care of my mother . sizing runs a little big..
Use these in taking care of my mother who is incontinent.They are strong compared to other latex gloves I have tried. I just love these gloves! I prefer latex over other gloves because they fit snugly on my hands.They are just thick enough for me to feel protected, yet thin enough that I can still feel what I'm doing. I've never had one of these gloves rip or tear. This is very important to me, as I don't want to get any grossness on my hands! I use them at work when changing diapers. use for general household chores in the kitchen and while changing baby diapers. I am a daycare assistant, and we use these gloves all the time. We use them when changing diapers, disinfecting toys, and bathroom assistance. They're thick enough that I feel protected, yet thin enough to feel what I'm doing. I love these gloves so much that I bought a box for myself for home. I use them while caring for my bedridden mother in law and have even found myself using them when my daughter has had an especially messy diaper! DO YOU SEND ITEMS TO HAWAII? IS SHIPPING STILL FREE IF PURCHASE THE AMT. NEEDED FOR FREE SHIPPING? What is the thickness of these gloves.? Not listing the thickness is like saying they are sub-standard and may rip/tear easily. Thank you. These gloves are much better quality and cheaper than those you will find in a store. I highly recomend. Excellent quality at an excellent price. Can't beat these .. .
Is there a discount for ordering by the case? Also could you ship to Kingston, Jamaica? Oh, be a sport. Buy a box of med. and if your hand is large, a box of large. If you have a small hand get the med. and small. Spring for the $7 as you will use them somewhere, or hang them on your Christmas tree. Use your normal glove size. These are latex gloves, so they are able to stretch. I'm not sure the brand but one had a size chart on the back of the box(hand print), maybe Invacare. I've found medium works well with most hand sizes.